If you have multiple student loans, consider consolidating them within the six-month grace period after you finish college. After all, who wants to make monthly payments to six different loan organizations with six different interest rates? If you consolidate your student loans you’ll be able to make payments to fewer creditors each month, plus (in most cases) enjoy a reduced interest rate. Plus, if you consolidate during the six-month grace period after you leave college, you may be eligible for an additional interest rate discount as well. Carefully write down the answers to these questions. As a general rule, you’ll be able to consolidate private loans with other private loans, and public loans with other public loans. Your goal is to consolidate your loans in such a way that you are paying the lowest rate of interest and the fewest fees on all of your outstanding debt. Once you’ve done this, get aggressive. Sure, it’s a good idea to have your regular monthly student loan payments automatically subtracted from your checking account each month. But why stop there? Do what more and more former college students are doing: take aggressive steps to try to pay off all your student loans in one to three years. Work two (or three!) jobs, share an apartment or a house with the maximum number of roommates, live at home . . . do everything you can to save up money for additional loan payments each month. Use this saved money to make extra payments on the principal of the highest interest loan you have on your list. The standard schedule for paying off most student loans is ten years or 120 payments. Just for fun, calculate what you’d have to pay each month in order to pay off your entire student loan debt in just three years. If you are currently paying 6.8 percent interest on student loan debt of $30,000, for instance, you’d need to pay $923.57 every month for 36 months. You get paid twice a month? That’s $461.78 out of each paycheck. Find a way to pay that (perhaps by living at home with your parents or by working a second or third job) and you could be out from under indentured servitude to student loan debt seven whole years early. I encourage you to try this, even if you end up sharing a tiny apartment with two roommates who snore, exchanging your grocery shopping and cleaning ability for free rent in a lonely elderly relative’s home, or sleeping on a twin bed in the corner of your parents’ cinderblock basement. Try this, even if it means canceling your gym membership, cooking boxed macaroni and cheese at home instead of eating out, selling your belongings on eBay or Craigslist, and giving up your cell phone plan in favor of a prepaid phone (a strategy that could cut your cell phone bill by $100 per month). See just how much you could save using the hilarious suggestions in the book The Tightwad Gazette: Promoting Thrift as a Viable Alternative Lifestyle by Amy Dacyczyn (Villard Books). The very best time to aggressively pay off student loan debt is when you’re young, before you have a mortgage, kids, diapers, and daycare to pay for. Do it as fast as you can. If you’re in a relationship with someone you care about and may one day marry, encourage him or her to do the same. You will never pay any sort of a penalty for paying student loan interest or principal before it’s technically due, so pay those loans off as fast as you can. What are your thoughts on dealing decisively with student loan debt? Comment below or LIKE Jeannie Burlowski, Author on Facebook, find this post on that page, and let’s talk about it there. Just #graduated #college? Here’s inspiration to #consolidate #studentloans and then #paythemoff fast. They can see the “Top 9 Questions Parents Are Asking Me About LAUNCH,” here. 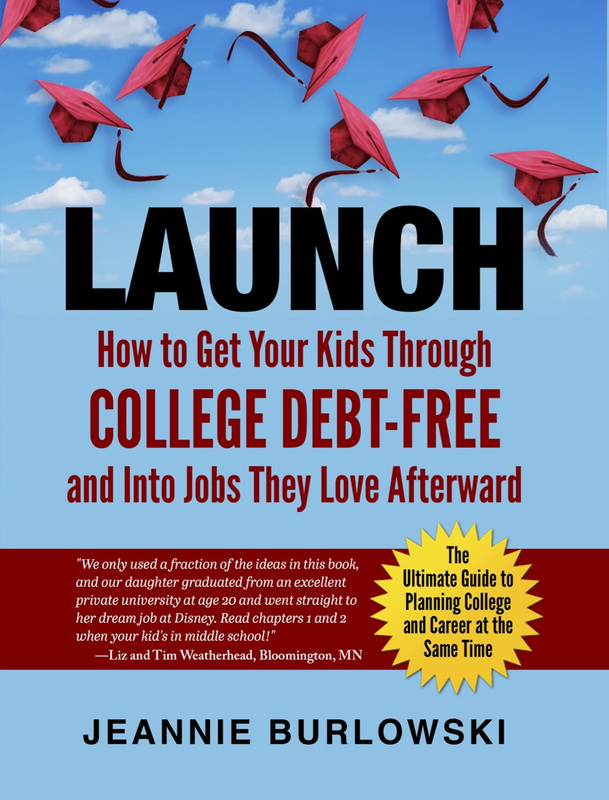 If your parents read just one chapter of LAUNCH every 1–3 months while your siblings are in middle school and high school, they’’ll know every viable strategy for debt-free college at exactly the right time to implement it. And if your siblings are already well past middle school? That’s OK; your parents can run to catch up. But the process of getting kids through college debt-free goes more smoothly the earlier parents start it—especially if they’re not able to save up any money to pay for college. Do you have friends who need to know what in the world to do with their student loan debt? I couldn’t locate another way to contact you directly so I hope it is ok to leave a comment here. I am interested in having our daughter take your 3 assessment tests to launch her into college with a more focused career path. She is beginning her senior year and we have several college tours set up this summer. My husband and I do not want her to go down the same path as we did, where we went to college “hoping” to find a career we enjoyed. My daughter does not love school all that much to begin with, so I think that finding those special interest areas for her will be key. Please let me know how to get in touch with Fred Johnson to begin this process, or what next steps you would like us to take. Melissa, you are so smart! I’ll respond to you in email!